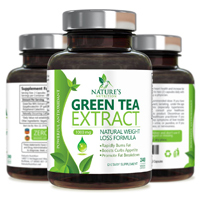 Nature’s Nutrition Green Tea Extract with EGCG claims to be a “natural weight loss formula”. It is supposedly made from the most powerful antioxidants and polyphenols found in Green Tea, more specifically, EGCG (epigallocatechin gallate). Green tea has long been touted as a powerful thermogenesis in the over-the-counter (OTC) weight loss industry for its ability to assist with fat burning and boosting weight loss. The manufacturer behind the product, Nature’s Nutrition, claims on the official product page for its Green Tea Extract dietary supplement, that it promotes healthy weight loss and fat burning, provides a stable increase in energy and may improve mood as well as enhance mental clarity. When this review was written, the Nature’s Nutrition Green Tea Extract formula contained 1,000 mg of Green Tea 98% Extract (dried leaves) [Epigallocatechin 3P gallate (EGCG) – 45% minimumPolyphenol Catechins – 75% minimum]. Caffeine and L-Theanine naturally occur in Green Tea. There is 1,000 mg of Green Tea per serving, which is equal to 2 capsules. Users are instructed to take 2 capsules in the morning with food. For optimal weight loss results, 2 capsules can be taken twice per day (up to a maximum of 4 capsules per day) or as recommended by your healthcare provider. Research has found that the polyphenols in green tea may be able to help prevent inflammation and swelling, as well as protect cartilage between the bones and lower joint degeneration. The naturally occurring caffeine content in green tea may affecting thinking and alertness, which may improve the function of brain messengers. The antioxidant properties of the tea may help to protect the blood vessels and the heart. It may also help to lower cholesterol. In terms of weight loss, there is conflicting research regarding green tea and obesity. Early research has shown that certain specific green tea extracts lower weight in obese people, while other research has suggested that drinking green tea or beverages that contain green tea may boost weight loss in overweight or obese adults. It appears that the effect of green tea on weight loss seems to be connected with the amount of catechins or caffeine contained in the supplement or beverage. That being said, other research has found that drinking green tea or taking green tea extract does not lower body weight or BMI. With all that in mind, overall, research suggests that taking green tea extract with caffeine seems to result in a slight reduction of BMI, waist circumference, and body weight compared to caffeine by itself. However, taking green tea without caffeine doesn’t seem to have any effect on weight reduction. Does Nature’s Nutrition Green Tea Extract Work? The bottom line is that more research needs to be conducted to determine just how effective green tea is for weight loss. Since this is the case it is not known if Nature’s Nutrition Green Tea will aid with weight loss. Furthermore, if you are planning to make this supplement or any supplement a regular part of your daily diet, you should first consult with your healthcare provider. Reading additional weight loss pills and supplements reviews can also help you find the right product for you. This entry was posted in Non-Prescription Diet Pills Reviews and tagged green tea on October 2, 2018 by Diet-Pills.cc.